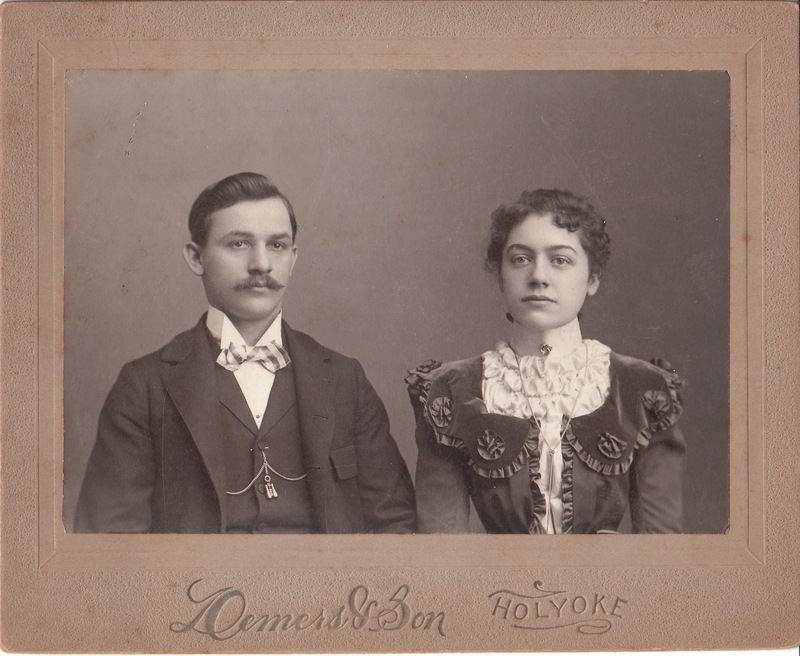 This photograph by Demers & Son of Holyoke, Massachusetts is a portrait of a very attractive and beautifully dressed couple. Is this the turn of the century version of Brad Pitt and Anjelina Jolie? The photographer of this photograph was from a studio called Demers & Son. The studio was located in Holyoke, Massachusetts. Demers & Son was comprised of Jacques Louis Demers ( c1833-1913) and his son Hormisdas Demers. They were French Canadians. “Mudra51”, provides biographical material about the pair on Flickr. Jacques was a French Canadian born in Montreal. He received his education in Montreal and studied portrait painting. He appears in Montreal directories as a working photographer from 1861 through 1875. Jacques came to Holyoke in 1883 and opened a photographic studio. The studio became known as Demers & Son by 1885 and the studio continued to do business until 1920. Jacques retired in 1909 and relocated to Ludlow, Massachusetts. He died there and was buried in Montreal. Hormisdas was born in Quebec, Canada in around 1867. His name, translated from Persian, is “the great wise one”. In 1881, Hormisdas first appears in a Quebec directory as a photographer. He came to Holyoke with his father. After the closure of Demers & Son, he still worked as a photographer and appears in the US census as a photographer through 1930. This vintage photograph is in excellent condition and has exceptional clarity (see scans). A handsome young couple pose for their portrait at the Reed photography studio in Quincy, Illinois. This unidentified endearing couple are nicely dressed, and the woman is wearing a necklace. Advertising on the bottom of the front of the cabinet card indicates that Reed operated a branch studio in La Grange, Missouri. To view other couple portraits, click on the category entitled “Couples”. Candace McCormick Reed (1818-1900) was born in Crab Orchard, Tennesee and moved to Missouri as a young girl. In 1842, she married Warren Reed, a photographer. The couple left Missouri and relocated to Quincy, Illinois, and established a daguerreotype gallery in 1848. Warren Reed died in 1858 and Candace Reed became the gallery owner and photographer. She quickly sold the gallery and opened a new gallery which she named the “Excelsia Gallery”. Candace’s sister, Miss Celina McCormick, worked as an assistant in the studio. At times, Candace worked under the name of Mrs W A Reed or Mrs Warren Reed. She kept her gallery up to date technologically and she was especially gifted in the art of painting photographs. She was known for her talent in enlarging old photographs and retouching them in crayon, oil, watercolor, and India ink. Candace was able to financially support her two children and mother-in-law, with proccds fro the business. Candace was admirably very civic minded. She established a support organization for soldiers and their families during the civil war. The group was called the “Sisters of the Good Samaritan”. She also served as a nurse in Union Army hospitals in Nashville, Chattanooga, and Vicksburg. While she was volunteering for the Union effort, she left her gallery in the care of her brother, who was also a photographer. After the war, Candace operated the Quincy gallery, and also ran galleries in Missouri. The galleries were located in the towns of Canton, La Grange, and Palmyra. Candace Reed’s Quincy gallery was in busines between 1848 and 1888. This cabinet card portrait is in very good condition (see scans). 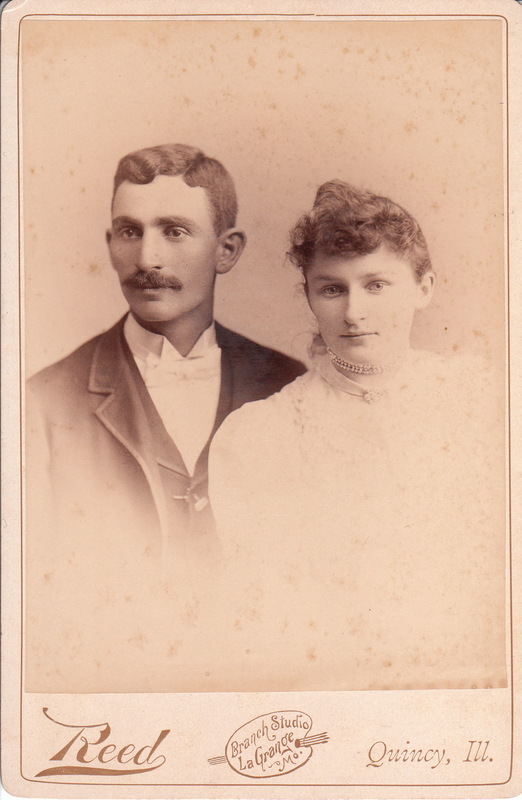 This cabinet card photograph captures a lovely couple posing for their portrait. They are very well dressed. Their attire is clearly aimed at keeping warm on a winter day. The couple appears to be affluent. Their clothing, including the young woman’s furs, lead me to that conclusion. The man and woman in this photograph, are displaying a very interesting expression. In my opiniion, they appear to be somewhat amused as they gaze at something or someone they deem a bit odd. Feel free to leave a comment concerning your interpretation of this couple’s facial expressions. This portrait photo was taken at a studio in Venice, Italy. The photographers were Giuseppe and Luitzi Vianelli. An advertisement for the Vianelli Brothers indicates that during their career they had photographed the Royal House’s of Italy, Germany, England, and Greece. The ad also states that the pair had won many photography honors. The ads appeared in publications dating between 1896 and 1899. 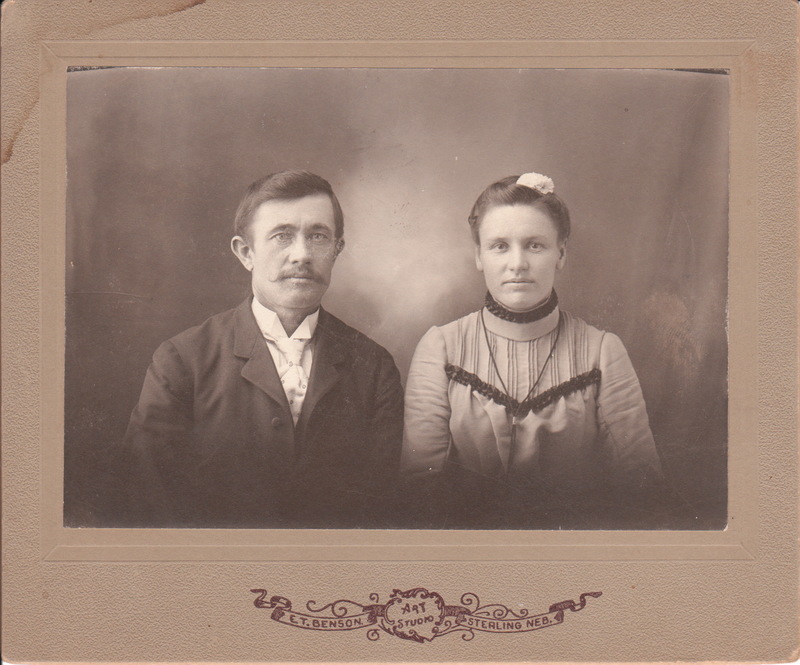 This cabinet card photo measures about 8″ x 3 3/4″ and is in very good condition (see scans). This vintage real photo postcard can be described as sensual, or even, sexually charged. A pretty in woman in a short dress and dark stockings sits on the lap of a tuxedoed man, and the two stare intently into each others eyes. The photo begs the observer to question the relationship of this lovely couple. Are they lovers? Are they performers, perhaps dance partners? The man and woman in this photograph are beautifully dressed. However, there is one infraction that needs the attention of the fashion police. The gentleman’s light colored striped socks deserve a citation. Dark socks would be more appropriate. The photographer of this portrait postcard is Georg Schoppmeyer who operated a photography business in Leipzig-Schonefeld, Germany. This vintage postcard is in very good condition (see scans). An attractive and well dressed couple pose for their portrait at a Chicopee Falls, Massachusetts, photo studio. The studio was operated by H. M. Judd. A brief biography of Henry Melville Judd (1848-1921) appears on the blog “Cabinet Card Photographers” (https://cabinetcardphotographers.blogspot.com/).) He was born in Massachusetts and lost both of his parents by the time he was fourteen years old. He never married and lived in rented rooms his entire adult life. Judd worked as a photographer in a number of Massachusetts towns including Amherst, Springfield, and Chicopee Falls. This photograph was taken while Judd occupied a space at 87 Front Street between 1889 and 1890. At some point in 1890 the name of the street was changed to Main Street. The Cabinet Card Photographers” blog reports that Judd was a photographer between 1877 and 1921. Chicopee is located on the Connecticut River and is part of the Springfield, Massachusetts metropolitan area. Toward the end of the nineteenth century, Chicopee Falls was a major manufacturing center of bicycles. Both the Overman Wheel Company (1882-1899) and the Spalding sporting goods company were located there. This cabinet card portrait is in excellent condition (see scans).